Remember when Zack Greinke started three consecutive games for the Brewers and nerds everywhere (like us) went bonkers because it was the COOLEST THING EVER and was such a harmonious convergence of circumstance that it could never happen again? (In case you forgot: Greinke started the second-to-last-game before the All Star Break, was ejected after four pitches, came back and started the next game, then took his usual four days of rest during the break and pitched the first game out of the chute). 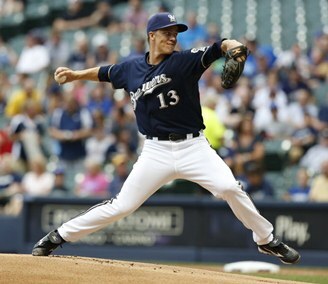 The Brewers have scratched Zack Greinke from his scheduled start against St. Louis on Wednesday but before folks start getting worked up that a trade is being consummated, the word from general manager Doug Melvin is that they simply want to give Greinke added rest after he pitched three times in a seven-day span, coming in and out of the all-star break. Greinke has no injury; apparently he just was fatigued from the recent work load. It should be noted that after a dynamite June, Greinke has allowed 14 earned runs in 14 July innings. Monday (100 home runs at Target Field already this season) edition: Wha' Happened?